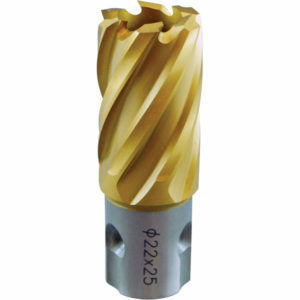 High Speed Steel Annular Cutter AT2250	– HOLEMAKER UNI SHANK TINITE (TiN) CUTTER 22MM X 50MM 	50mm DEPTH M2AL HIGH SPEED STEEL MATERIAL M2AL High Speed Steel is a high alloy material with a hardness of up to 67.5 HRC. TITANIUM NITRIDE COATING The Titanium Nitride coating increases tool life by providing the following benefits:  Increased surface hardness to 85HRC  Ceramic surface reducing friction by up to 30%  Especially resistant to cold welding STEP HARDENED PROCESS Cutter is manufactured with extremely hard tooth tips for increased cutter performance while maintaining a softer body which is less susceptible to breakage. 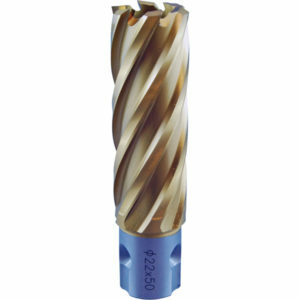 MULTI-CUT GEOMETRY Provides smooth and fast cutting with decreased chatter. This also increases the cutters ability to remove swarf away from the cut and helps to enhance centering. FULLY GROUND WITH INTERNAL RELIEF This feature allows Holemaker cutters to produce reamed quality burr-free holes. 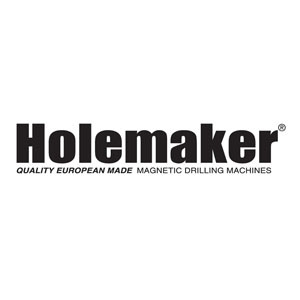 UNIVERSAL SHANK 19.05mm (3/4) Universal Shank with 2 flat sections to suit most magnetic base drilling machines.